A staple of the beef cattle industry, the Polled Hereford has fought a long battle to occupy its current position as one of the primary cattle breeds in the world’s beef market. Possessing a typically large, muscular, red frame, with a white face, crest, dewlap and underline—it is one of the two most common purebred beef breeds in the US. 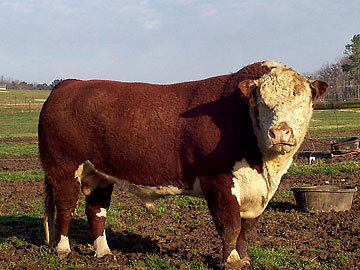 The horned Hereford was developed in Herefordshire, England in the mid 18th century. Its reputation as a hardy animal opened the door for introduction and acceptance into the newly beginning cattle industry of the United States, in 1817. The first Herefords were raised in the state of New York, their spread to other states following shortly after. It wasn’t until 1898 after seeing a polled Hereford at the Trans Mississippi World Fair that Warren Gammon, an Iowa rancher, began to look closely into the benefit of a naturally hornless, known as polled, variety of Hereford. Thought to cause less injury to self and ranchers, the development of a genetically polled Hereford became his objective. In 1901, after an extensive search for all polled Herefords, he founded the American Polled Cattle Club, with only 11 whitefaces. Currently known as the American Polled Hereford Association, it is combined with the American Hereford Association. The Polled Hereford are highly resilient cattle, able to withstand harsh weather conditions and insufficient grazing. It is because of their adaptability, they have effortlessly spread to every corner of cattle country. Considered to be one of the gentlest natured cattle breeds, owners of these cattle will be quick to point out the ease with which these cattle are handled. Their docile temperament continues to be unrivaled by other breeds. In spite of their qualities, the status of the Polled Hereford was tainted by negligent breeding. A genetically hornless animal is almost certainly beneficial to the beef cattle industry. Dehorning calves can be an expensive endeavor, the stress surrounding the procedure at times proving to be detrimental to a calf’s development. The desire to have naturally polled cattle led to indiscriminate breeding. Crosses to any polled bull or cow became the rule in hopes of repeating the hornless condition in offspring. Indisputably the quality of the cattle breed decreased when only its polled status was considered when deciding a cross. This practice has steadily come to an end, but left a blemish on the breed’s reputation. The carcass value is on the rise however, as more and more people are returning to the breeding of the white-faced red cattle. Though not the norm, the Polled Hereford’s meat may at times prove to rival the Angus’ renowned marbling. Hereford cattle (& Hereford crosses) are now being marketed under a branded beef program called Certified Hereford Beef. The continued growth of this program is an indication of consumer satisfaction and confidence in Hereford beef quality. Its high reproductive efficiency is quickly garnering it a return to grace. Polled Hereford calves are quick to mature and flesh easily, making them popular in cross breeding programs such as the black baldie (Hereford / Angus), the super baldie (Hereford / Brangus), and the tigerstripe (Hereford / Brahman) to name a few. It is in essence an improving breed, which taking into account already excellent characteristics in terms of frame, reproductive success and high meat quality, will only serve to keep the Polled Hereford predominant within the beef cattle industry.